Quizmaker 360 makes it easy to deliver quizzes and surveys to learners with tablets and smartphones. Here are answers to common questions about publishing mobile-ready quizzes. How do I publish quizzes for mobile devices? Should I include Articulate Mobile Player output when publishing Quizmaker 360 quizzes? Do HTML5, Flash, and Articulate Mobile Player quizzes look and behave the same? How do learners view quizzes on tablets and smartphones? Are published quizzes responsive? Do they adapt to different screen sizes? Can quizzes be viewed on iPads? Can quizzes be viewed on iPhones? Can quizzes be viewed on Android devices? Do learners need an internet connection to view quizzes in the Articulate Mobile Player? How do you remove a quiz from the Articulate Mobile Player app? How do I track learners' progress when they view content on mobile devices? When you publish for Articulate 360, Web, Articulate Online, or LMS, click the Formats property on the Publish window to open this Publish Formats dialog. HTML5: This publishes your quiz as HTML5 output only. HTML5/Flash: This publishes your quiz as HTML5 first with Flash fallback. Learners will see HTML5 output if they’re using a supported HTML5 browser. If not, they’ll see Flash output. This is the default option, which covers the widest audience and provides the best experience. Flash/HTML5: This publishes your quiz as Flash first with HTML5 fallback. Learners will see Flash output if they’re using a Flash-enabled browser. If not, they’ll see HTML5 output. Flash: This publishes your quiz as Flash output only. 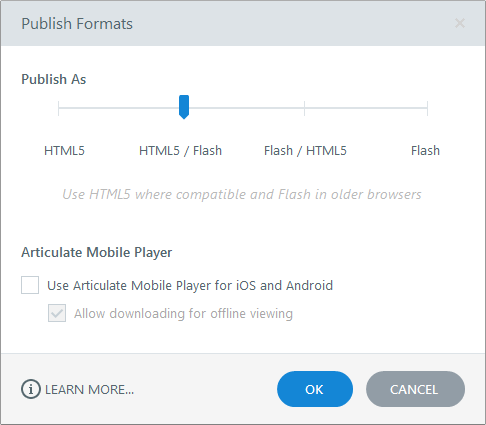 If you choose one of the publish formats above that includes Flash output, you’ll also have the option to include Articulate Mobile Player output. Just mark the box to Use Articulate Mobile Player for iOS and Android. Articulate Mobile Player output is the default view for learners with iPads and Android devices. While Quizmaker 360’s superior HTML5 output and new responsive player give learners the best viewing experience on tablets and smartphones, one unique benefit of the Articulate Mobile Player app is the option to view content offline. To let learners view your quiz offline, just mark the box to Allow downloading for offline viewing. After downloading a quiz to their Articulate Mobile Player, learners can view it at any time, with or without internet access, even if you remove the quiz from Articulate 360. Tip: Offline viewing isn’t currently supported for Articulate Online and LMS content. Click OK to save your selections and return to the Publish window. Quizmaker 360’s superior HTML5 output and new responsive player give learners the best viewing experience on tablets and smartphones, making Articulate Mobile Player (AMP) output unnecessary, unless learners need to download content for offline viewing or your quiz includes FLV videos with alpha-channel transparency, both of which are supported in AMP. Most features behave the same way in HTML5, Flash, and Articulate Mobile Player output, but some don't. See this article for the expected behavior of each Quizmaker 360 feature in HTML5, Flash, and the Articulate Mobile Player. Give learners a link to your quiz (see the table below). When learners launch it, they'll see the right format (HTML5, Flash, or Articulate Mobile Player) based on the devices and browsers they’re using and the publish formats you included. Open your web browser to your Articulate Review home page and click your quiz to open it. Click Share in the upper right corner. If you want to password-protect your quiz, mark the box to Set a password and enter a password in the field provided. Copy the shareable link, then send it to your viewers. Be sure to give them the password, too, if you added one. Upload your published quiz to a web server, then send learners a link to the quiz.html file. Invite learners to view your published quiz. See this tutorial for details. Upload your published quiz to your LMS. Each LMS uses a different process for this. Contact your LMS administrator if you need help uploading, launching, or tracking content. HTML5 quizzes published with Quizmaker 360 use the all-new responsive player when viewed on tablets and smartphones. The responsive player dynamically adapts to different tablets and smartphones, providing an optimized view of your quiz on every device—no extra work required. It fluidly responds to different mobile screen sizes and orientations, eliminating browser chrome, and delivering mobile-friendly playback controls. The responsive player moves out of the way to maximize the screen real estate for your quiz content. Your content will maintain its aspect ratio, but it’ll scale to fill as much of the screen as possible on tablets and smartphones. Just include HTML5 output when you publish and let the responsive player do all the work for you. See these responsive player FAQs for details. Yes. Include HTML5 output and/or Articulate Mobile Player output when you publish. When learners launch your quiz, they’ll automatically see the right version based on your publishing choices. If you included Articulate Mobile Player output, the quiz will launch in the free Articulate Mobile Player app for iPad. If learners don’t already have the app, they’ll be prompted to install it. If you didn’t include Articulate Mobile Player output, the HTML5 version of your quiz will launch in mobile Safari. Yes. Include HTML5 output when you publish. When learners launch your quiz, it’ll automatically open in mobile Safari. If you included Articulate Mobile Player output, the quiz will launch in the free Articulate Mobile Player app for Android. If learners don’t already have the app, they’ll be prompted to install it. If you didn’t include Articulate Mobile Player output, the HTML5 version of your quiz will launch in the Chrome browser. Initially, yes. However, if you marked the option to let learners download the quiz for offline viewing, they only need to be connected to the internet long enough to download it. Thereafter, they can view the quiz at any time with or without an internet connection. See this user guide for details. If you need to track learners' progress in Articulate Online or an LMS, they must be connected to the internet. Otherwise, the quiz won’t be able to send data to Articulate Online or your LMS. Long-press any item in your Articulate Mobile Player library until an X icon appears in the upper left corner of each thumbnail, then tap the X icon for each item you want to delete. When you're finished, tap anywhere on the screen to hide the X icons. The best way to track learners on tablets and smartphones is to include HTML5 output when you publish. Quizmaker 360 HTML5 output is supported in AICC, SCORM, and Tin Can API learning management systems (LMSs) as well as Articulate Online. If you’re using a Tin Can API LMS or Articulate Online, you can also include Articulate Mobile Player output when you publish. The Articulate Mobile Player app doesn’t support AICC or SCORM. To recap, HTML5 output covers all learners and LMSs. Articulate Mobile Player output covers learners with iPads and Android devices as well as Articulate Online and Tin Can API LMSs.